➤ Frequently asked questions & answers on the latest (6/9/2016) FAA Policy on Use of Hangars at Obligated Airports. ➤ Legal brief by Peter Kirsch on latest FAA Hangar Use Policy. 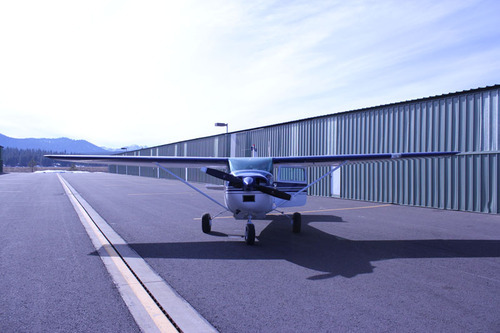 Home Basing: <$0.04/sf/mth> Register your aircraft as "Home Based" in either Nevada or Placer County (depending on which county your hangar is in) and qualify for this rental rate discount incentive. Annual Payment: <$0.01/sf/mth> Pay your monthly rental fees a year in advance in one lump payment and qualify for this rental rate discount incentive. Fly Quiet 1 : <$0.02/sf/mth> Agree to respect our neighbors by contractual agreement and not to fly between the hours of 11pm - 6am and qualify for this rental rate discount incentive. Fly Quiet 2 : <$0.02/sf/mth> Agree to respect our neighbors by contractual agreement and not to fly between the hours of 10:30pm - 6:30am and qualify for this rental rate discount incentive plus the FQ1 discount. Truckee Tahoe Airport reserves a small number of hangars for transient aircraft overnight rental use. The standard rental charge for an overnight T-Hangar is $50 (no tug), and $500 for an Executive Hangar (includes tug). Additional charges apply for heat requests in the Executive Hangar N-01. Reservations are NOT accepted for overnight hangar rentals. Pilots can check on availability the day that they would like an overnight hangar rental. If available, charges commence immediately upon hangar request, either in person or by a credit card over the phone on a first-come, first serve basis. For overnight hangar availability contact KTRK UNICOM, 7 days per week, 7am - 9pm at (530) 587-4119 ext 100. *Notes: Additional charges may apply for tug services, special equipment, etc. T-Hangars are NOT heated. 110V power is available. Keys are not issued for overnight hangar rentals, pilots must call, radio or stop by UNICOM to request hangar access. Hangar rental fees are separate from landing fees. Pilots can check into a T-Hangar daily between the hours of 7am - 8:30pm. Pilots can check into an Executive Hangar (for aircraft requiring a tug) daily between the hours of 7am - 4:30pm. Be advised that during snow events, hangar access may not be immediately available. 20 Executive Box Hangar on field rent for $0.4582/sf (avg size 4,025sf) with a flat $31/mth electricity charge plus an annual County Possessory Tax (~$750/yr depending on hangar variables). 9 New 2019 Executive Hangars (Rows November and Papa) rent for $2,800/mth, plus all appropriate utilities. * If you home-base your aircraft at KTRK you will also be responsible for a County levied Property Tax. There are active wailtlists for both T-Hangars and Executive Box Hangars at KTRK.